Conducting an asphalt pavement inspection is important to assess the current state of your asphalt. Inspecting asphalt during rain can be particularly beneficial because water can show a number of deficiencies in a hard surface like asphalt. Rutting – Rutting is a depression in your asphalt’s surface within the wheel path. It results from stress and subgrade deformation. Depending on the severity of the rut, it may not be so evident. When it rains, water may pool in this depressed area, making identification easier. Cracks – When the surface of your pavement begins to dry, moisture in the cracks and deeper tissues of your asphalt will take longer to dry, remaining darker than the surface. 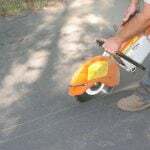 This will allow your professional paving company to easily identify cracked areas. Drainage Issues – If standing water is laying in places that it shouldn’t, this could be an indication that your parking lot’s drainage is not setup/working correctly. 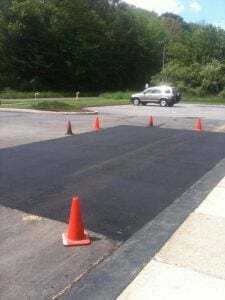 The beauty of asphalt is that asphalt repair can be limited to only the exact areas that need restoration. Once the areas that need repair have been identified, your professional pavers will mark the affected areas clearly with paint, and these areas will then be removed. At this point, the reasons for surface failure should be easily identifiable, since the subgrade is now exposed. Repairs to your subgrade, if necessary, will be made and this removed section will be refilled with new hot asphalt mix. All joints/seams created during this repair process will need to be sealed to avoid water penetration to the base. Cold Planing – This can be used on asphalt that is greater than 2 inches thick with surface fractures that appear to be of hairline thickness only and/or if the surface is rough and suffering from pitting. 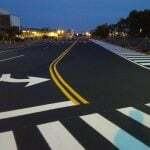 Cold planing is when the top 1 or 2 inches are shaved off and replaced with fresh asphalt. Subgrade – The overall performance of pavement relies heavily on the quality of its subgrade. The subgrade serves as a foundation and helps to alleviate the harsh effects of the climate. Aggregate Base – Aggregates are used in the granular bases and subbase layers below the surface of asphalt. Its main purposes are to reduce stress on subgrade, and provide drainage. Some tests that can be done to evaluate the condition of your aggregate base are; gradation analysis, absorption, soundness, freeze-thaw, abrasion, acid solubility, etc. 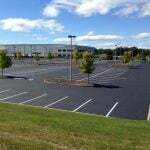 Asphalt – Quality material and quality install are both very important in determining the condition of your asphalt. Areas of evaluation include; asphalt binder, mixtures, thickness measurement, hot mix asphalt, testing of asphalt emulsions and cutbacks, etc. Inspecting the current state of your asphalt is a crucial first step to asphalt repairs. Defects and issues with your pavement will become very evident shortly after, or during rain. 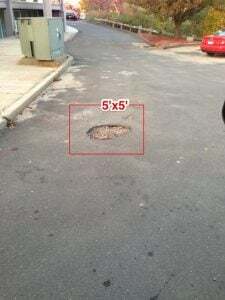 This is a great time for you to conduct a preliminary DIY pavement inspection to spot some obvious problem areas and get an idea of what sort of repairs you are looking at. 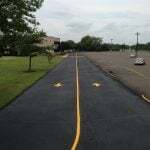 Your professional paving company can do an extensive inspection of your parking lot pavement to determine exactly what issues are occurring, and what needs to be done to remedy them. We know winter has done some damage to your asphalt, but we can help! Contact EastCoat Pavement Services today for your free consultation!